Our engineering team has expertise in process design, equipment selection, lot traceability, and inventory management. 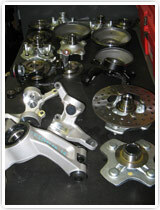 In addition to quality machined products, Jayna, Inc. offers assembly services for simple or complex components. Many products are machined, assembled, packaged and shipped daily from our locations. All products shipped from Jayna, Inc. are inspected and ready for use on our customers’ lines. Copyright ©2007. Jayna, Inc. All Rights Reserved.